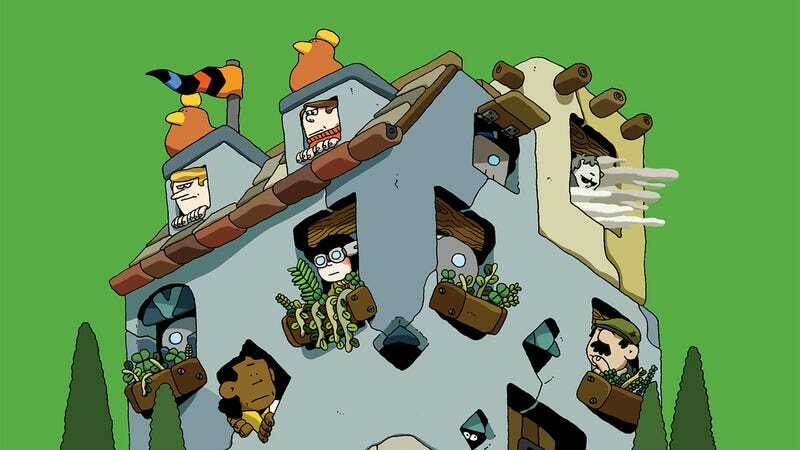 For the last three years, spring has been the season for new Ben Sears graphic novels from Koyama Press, chronicling the delightful adventures of Plus Man and Hank as they make their way through vibrant, playfully designed landscapes. It’s that time of the year again, and next month, Sears’ duo is back in House Of The Black Spot, a murder mystery that puts the focus on Hank the robot as he and his best friend investigate the death of Hank’s uncle. Sears creates comics that are easy for kids to enjoy with their crisp cartooning, bright colors, and clever sense of humor, but he also includes rich thematic content that makes his books a more substantial read for adults. With his latest release, Sears is delving into gentrification and shady business practices that force long-time residents out of their homes, examining how developers force change in neighborhoods without considering how it impacts the people who already live there. This exclusive preview of House Of The Black Spot explores this theme as Plus Man and Hank deliver groceries to an older woman who tells them about how landlords are evicting tenants to turn their properties into weekend rentals for rich people. The excerpt opens with Hank’s uncle dropping dead after seeing an unexpected face from his past, setting an ominous tone that is broken by an explosion of color and other visual stimuli when the action jumps to Plus Man and Hank navigating through the busy traffic of Bolt City. The amount of detail in Sears’ environmental designs is astounding, and one of the great joys of reading his work is visiting these bustling locales full of small touches that compel the eye to linger on the visuals and take in the full scope of the setting. Sears’ character work is equally engaging, and the exaggeration of Plus Man’s expressions balances out the lack of emotion from Hank, who’s lack of a face forces Sears to find other ways for the character to emote. There’s so much charm in Sears’ work, and House Of The Black Spot is another outstanding entry in this springtime series.